Homeowners plan to increase spending on renovations in 2017. LightStream survey cites surge in millennials planning home improvement projects. ATLANTA, Feb. 27, 2017 /PRNewswire/ -- More than half (59 percent) of homeowners are planning to spend money on home improvement projects in 2017, according to the fourth annual survey by LightStream, the national online lending division of SunTrust Banks, Inc. (NYSE: STI). Notably, a major shift is occurring on both a regional and multigenerational level as homeowners project higher average spending on renovations this year. The LightStream survey was conducted online by Harris Poll in January 2017. Key findings suggest homeowners are planning to spend more on home improvements in 2017. Forty-two percent aim to spend $5,000 or more, and nearly a quarter (23 percent) plan to spend $10,000 or more – the highest percentage since the inaugural study in 20141. Research analysts at the Remodeling Futures Program at the Joint Center for Housing Studies of Harvard University agree, forecasting home improvement and repair expenditures to remain elevated throughout 2017. Outdoor living remodeling continues to dominate as the number-one home improvement project, with 41 percent planning outdoor projects such as decks, patios or landscape renovations. Home repairs/technology (32 percent), bathroom updates (28 percent) and kitchen remodels (24 percent) round out the top four projects. Pool installation experienced a survey high of seven percent2, a 40 percent increase since 20163. Both garages and barns also made the list of desired projects this year (14 and 4 percent, respectively). While 60 percent of homeowners plan to tap savings to pay for renovation projects, credit card use increased to 29 percent, up 16 percent from last year4. Home equity lines of credit (9 percent), home improvement loans (7 percent) and liquidating or tapping into investments (6 percent) are also cited as payment strategies. "This year's survey shows that many homeowners plan to pay for renovations with credit cards," said Todd Nelson, LightStream business development officer. "Though credit cards typically advertise rewards, they may in fact have high interest rates or convert to higher rates after an introductory period of time. For large-ticket home improvement purchases, credit cards may not be practical. It's important that consumers explore alternatives, such as a home improvement loan or home equity line of credit. These options often offer lower interest rates, and allow homeowners to better manage their overall costs and payments." Millennial homeowners (ages 18-34), once considered adverse to home ownership, are behind a new renovation trend captured by the survey. In fact, 69 percent plan to spend money on renovation projects this year, a 25 percent increase since 20145. Generation Xers (ages 35-44) lead all groups, with nearly three-quarters of homeowners (72 percent) planning to spend on home improvement projects this year. The boomer generation (ages 55-64) intends to focus on kitchen and bath remodeling (12 and 13 percent respectively) as well as home repair/technology upgrades (18 percent), although their overall plans to spend dropped to 57 percent, an eleven percent decrease since 20166. Jumping from last to first, homeowners in the West are seeing major growth, with 64 percent planning home improvement projects in 2017, a 10 percent increase since 20167. Sixty-one percent of homeowners in the South, and more than half of homeowners in the Midwest and Northeast (56 percent for both), also plan to spend money on renovations this year. For more information, visit LightStream.com/2017HomeReno. SunTrust Banks, Inc. is a purpose-driven company dedicated to Lighting the Way to Financial Well-Being for the people, businesses and communities it serves. Headquartered in Atlanta, the company operates an extensive branch and ATM network throughout the high-growth Southeast and Mid-Atlantic states, along with 24-hour digital access. Certain business lines serve consumer, commercial, corporate and institutional clients nationally. As of December 31, 2016, SunTrust had total assets of $205 billion and total deposits of $160 billion. The company provides deposit, credit, trust, investment, mortgage, asset management, securities brokerage, and capital market services. SunTrust leads onUp, a national movement inspiring Americans to build financial confidence. Join the movement at onUp.com. This year's survey was conducted online within the United States by Harris Poll on behalf of LightStream from January 26-30, 2017 among 3,172 U.S. adults ages 18 and older (2,092 homeowners ages 18+, among whom 1,238 plan to spend money on home improvements in 2017). The 2016 survey was conducted from February 1-3, 2016 among 2,048 U.S. adults ages 18 and older (1,258 are homeowners) ages 18+, among whom 763 plan to spend money on home improvements in 2016. The 2015 survey was conducted from February 6-10, 2015 among 2, 015 U.S. adults ages 18 and older (1,279 are homeowners) ages 18+, among whom 693 plan to spend money on home improvements in 2015. 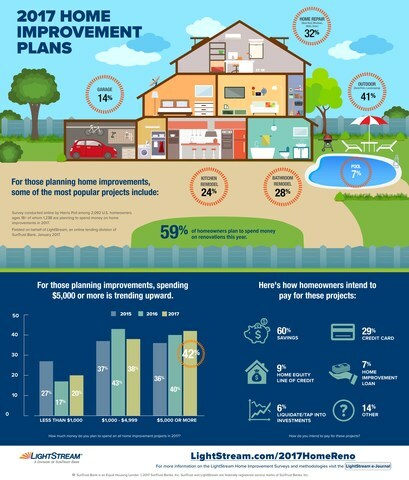 The 2014 survey was conducted from March 6-10, 2014 among 1,291 homeowners ages 18+, among whom 684 plan to spend money on home improvements in 2014. These online surveys are not based on a probability sample and therefore no estimate of theoretical sampling error can be calculated. For complete survey methodology, including weighting variables, please contact Julie.Olian@LightStream.com. * The APR listed is for an unsecured home improvement, pool or solar system loan between $10,000 and $24,999 with a term between 24 and 36 months, for applicants with excellent credit. APR may differ based on loan purpose, amount, term, and applicant credit profile. Rate is accurate as of 2/27/2017 and quoted with AutoPay discount, which is only available when AutoPay is selected prior to loan funding. Rates under the invoicing option are 0.50% higher. Subject to credit approval. Conditions and limitations apply. Advertised rates and terms are subject to change without notice. SunTrust Bank is an Equal Housing Lender. © 2017 SunTrust Banks, Inc. All rights reserved. SunTrust and LightStream are federally registered service marks of SunTrust Banks, Inc. All other trademarks are the property of their respective owners.